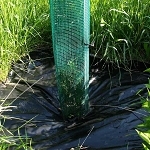 SunFlex tree grow tube stakes flex with the wind to build stronger stems and are virtually unbreakable for reuse again and again. Harness The Wind To Grow Stronger, Straighter & Healthier Stems The Way Tree Nurseries Do - Naturally! 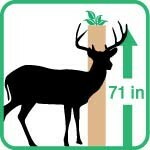 Your grow tube installation is only as good as the stake you choose for the job! The same goes for traditional tree tubes and tree-shelter installations. That's why we pioneered our durable, virtually unbreakable, and reusable Trunk-Builder stake line. 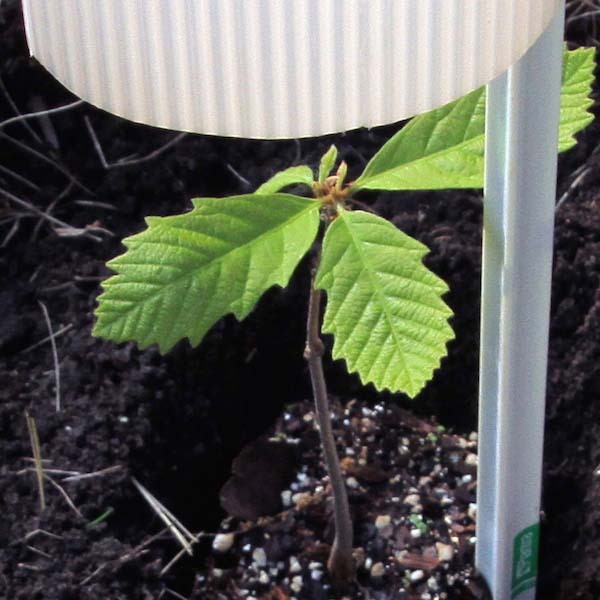 Trunk-Builder's patented design flexes in the wind to help seedlings develop stronger stems and are engineered to stand tall with built-in super strong “memory” to return to a straight position even on the windiest sites. Professional nurseries have used fiberglass training systems for decades to grow trees tall, straight, and strong. Trunk-Builder's purpose-built design, for the first time, delivers the same benefits with grow tubes. Put Trunk-Builder stakes to work in your field and grow your trees the way the pros do. 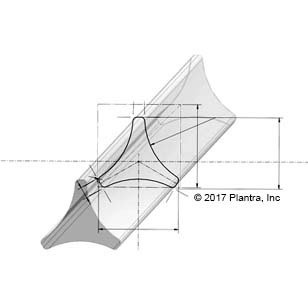 Trunk-Builder stakes help grow stronger tree stems in a grow tube from the start - Like everything we do at Plantra, it all begins with growing the plant and Trunk-Builder stakes are no exception. Trees use a variety of environmental influences to grow and wind is an important factor in normal stem development. Trunk-Builder harnesses the wind to stimulate plant growth responses that encourage stronger stems - a process known as Thigmomorpogenesis. Unlike traditional, rigid staking systems which can lock tubes in place and prevent natural movement of the developing tree, Trunk-Builder gently moves back and forth when the wind blows and returns to straight to train your trees tall, straight and strong. Trunk-building flexibility - Trunk-Builder bends naturally when when the wind blows (just like a tree) and has "memory" to return to straight when the wind stops (just like a tree) to keep your trees growing straight up! The key to Trunk-Builder is balancing strength and flexibility which all starts with a fiber-reinforced backbone composed of woven, overlapping layers of e-glass that bend but don't break. 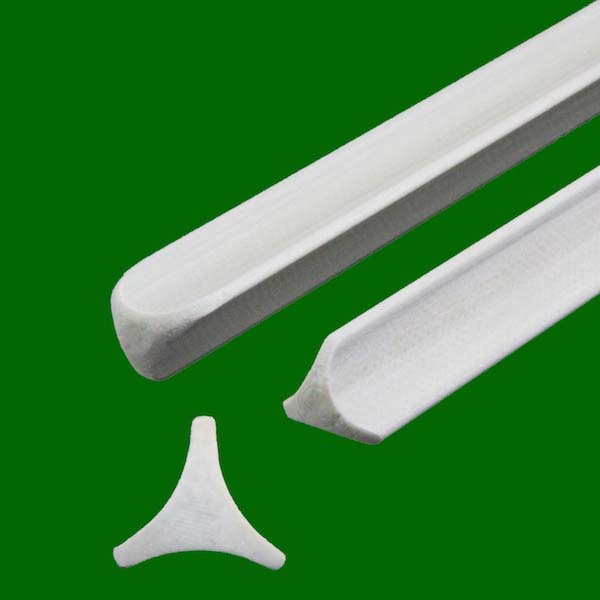 Fiber-reinforcement makes this stake much stronger when compared to non-reinforced fiberglass rods. Professionally engineered for superior strength - Solid reinforced construction combined with load-bearing, 3-sided geometry gives Trunk-Builder greater strength and memory than standard 1/2-inch round fiberglass rods or non-reinforced, hollow plastic or light gauge metal materials that bend and stay bent. 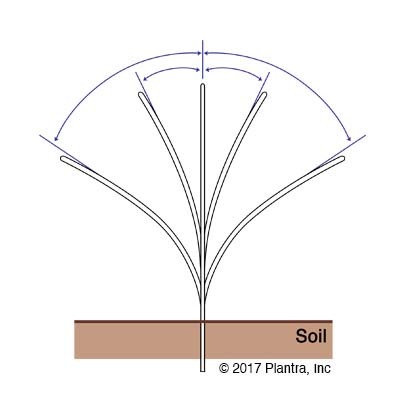 Soil-gripping surface area - Three-side geometry increases surface area contact with the soil to hold fast even on the windiest sites. Proven technology - Nurseries have long used fiberglass stakes to train trees tall, straight and strong. 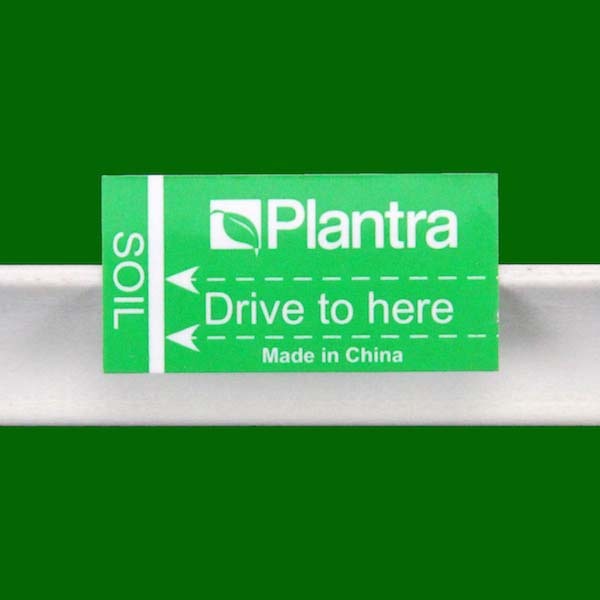 Trunk-Builder stakes for the first time deliver the same benefits when used with SunFlex grow tubes. Lighter weight - Multi-sided geometry delivers greater strength per unit of weight whether building strength into an air plane wing or using roof trusses in a building. Likewise, Trunk-Builder leverages complex geometry to deliver greater strength in a lighter weight stake. Lighter weight ships for less money and is easier to carry in the field. Weighing in at less than 1/3 the weight of conventional oak stakes means you can carry three times as many Trunk-Builder stakes at one time - all without getting splinters from wood! Ground line markers - Each Trunk-Builder stake comes marked with a “ground-line” indicator so you don’t have guess how deep to drive the stake. Just drive the stake until the “ground-line” is flush with the soil and you’re done! Easy to drive - Rugged, solid construction and soil penetrating profile make driving Trunk-Builder a dream when compared to wooden or hollow plastic and metal materials.This saves time and reduces worker fatigue to get your planting jobs jobs finished sooner and with less effort. Trunk-Builder Lasts.... and Lasts - Trunk-Builder is U.V resistant to the sun's rays and will last for years and years to stretch your investment even further when it comes time to plant again. No need to replace rotting wood or warping hollow, plastic and metal stakes. trunk-Buildergets the job done now and in the future. Put Trunk-Builder to work in your fields and you'll get stronger and straighter trees with less time and money! Why Choose Trunk-Builder Over Other Stake Materials? That's easy, because only Trunk-Builder helps grow stronger, straighter stems and trunks, the first time, every time! We've said it before but it's worth repeating......."Your grow tube installation or tree training project is only as good as the stake you choose for the job!" 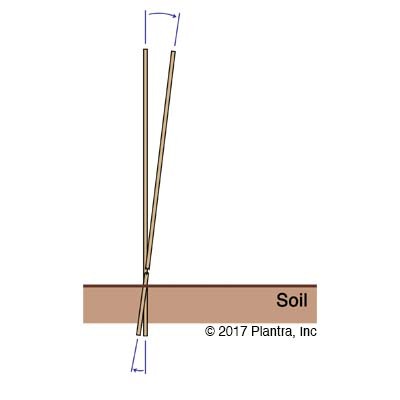 That's why we engineered Trunk-Builder stakes to stand-up straight on the toughest sites from wild-lands and commercial ag fields to high traffic boulevards and serious home gardens. Trunk-Builder is a game changer when it comes to growing stronger, healthier tree stems with superior strength all with a stake that lasts until your trees are on their own. But Trunk-Builder doesn't stop there. It's rugged construction is super easy to use whether your planting crews are professionals or weekend warriors. Engineered strong but lightweight and with the only ground line offered for grow tube stakes, Trunk-Builder slashes time and labor costs so you get the job done fast, right and within budget. And when your trees are on their own Trunk-Builder can be used again and again. Still not convinced? Let's "dig deeper" to see why Trunk-Builder stands above the rest. Plant biologists have long understood the role that stem movement contributes to strength and stem caliper. Stem movement caused by mechanical influences from wind or pushing and bumping by animals or people triggers chemical responses in the plant including "thigmomorphogenesis." Thigmomorphogenesis (Thigma (meaning to "touch") alters growth patterns to respond to wind and mechanical influences that cause the growing tree to move back and forth. The result is growth leading to stockier and stronger stems. To get stockier, stronger and natural stem growth you need a support stake that moves with the tree. That's where Trunk-Builder stands alone in a forest of rigid stakes made of wood, bamboo and metal that were once the only options to support grow tubes, tree tubes and tree-shelters. The image to the right illustrates how Trunk-Builder "flexes" above ground to move with your trees as they grow and promote stronger stems....naturally! And unlike hollow plastic plumbing pipe which can bend and stay bent, Trunk-Builder's fiber-reinforced design bends when the wind blows and snaps back straight when it stops. Wood and bamboo are strong building materials important to construction. 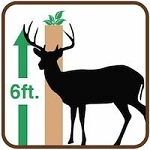 However, when driven into the ground and subjected to wind or soil moisture these stakes are poor choices to support grow tubes, tree tubes and tree shelters or to train trees with the strongest stems. It's no secret that these materials do not flex which, as we've discussed, inhibits optimal growth necessary for strong stems and trunks. What might not be known is how short-lived wood and bamboo are in the field. Natural materials like wood and bamboo degrade and fail when exposed to rain, microbial activity, and temperatures conducive to freezing and cracking or conditions that promote decay and rot. Many wood and bamboo materials have been used in the past with disappointing results. One of the most often used materials, because of its low cost, is Pine lath. Unfortunately lath stakes (often used by surveyors for temporary marking) one of the poorest choices because it often rots in the first 12 months (see image below of rotted and broken lath stake). 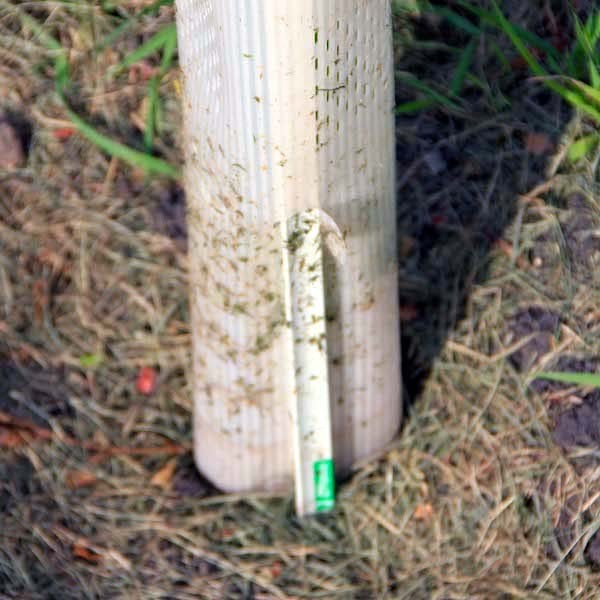 Even mighty oak stakes rot-off, break or warp (see image on to right) in the first several seasons often within just two years. And it's worse for bamboo. Even stout 1-inch diameter bamboo splinters when driven into the ground and often fails to last into the second season before rotting and breaking off. Considering grow tubes need to remain in place for 7 years (or even longer in many cases) wood or bamboo is clearly no match for job. If your trees are worth planting, they're worth Planting Like You Mean It and this means using tools designed to do the work. Say good-bye to materials that don't work or were never intended to be a part of your planting. Trunk-Builder is engineered and "purpose-built" for the job of supporting grow tubes and training tree trunks. Designed to be 110% the strength of 1/2 inch round fiberglass rod Trunk-Builder is the new benchmark for field performance. Unlike Trunk-Builder, rigid materials like wood, bamboo, metal rebar, t-posts and electrical conduit were designed for very different uses none of which involved supporting grow tubes and growing healthy, stouter stems and trunks.....naturally. The same goes for flimsy, hollow plastic tubes and PVC pipe. These plastic materials were designed for much different uses and while they can bend, they have little or no "flex memory" and can stay bent. The backbone of Trunk-Builder was born in geometry and reinforced with super strong e-glass fibers. 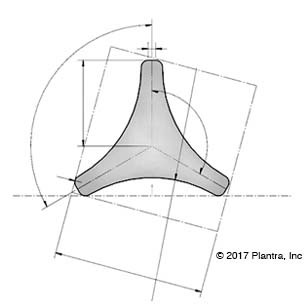 The 3-sided delta profile (see image above and on left) was engineered to deliver tremendous strength to weight ratio with rapid "flex-memory" that bends with the wind and returns to straight when the wind stops. Trunk-Builder won't rot and is virtually unbreakable. Tired of everything from wind to animals snapping off your oak and bamboo stakes at ground level? So were we. That's why we engineered Trunk-Builder tough enough to stand up to the toughest winds to even to ole' mossy-back when fall buck antler rub season is in full swing. And unlike pencil rod or flimsy hollow plastic stakes which can bend under a load and stay bent, Trunk-Builder returns upright to keep growing your trees up straight and strong. 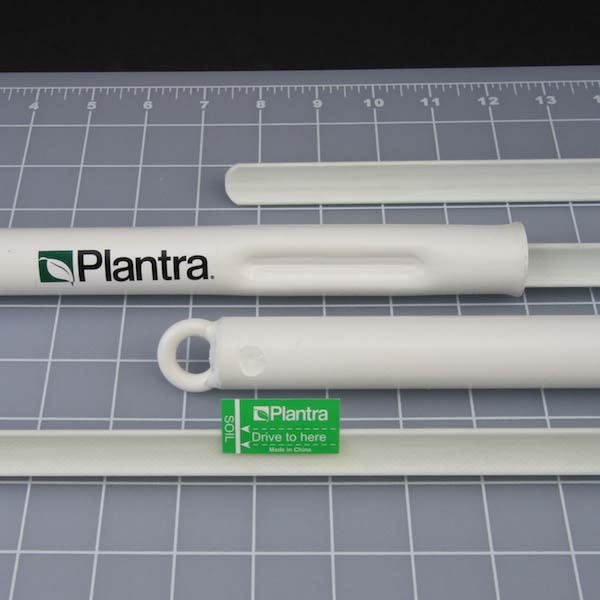 Grow tube stake installation should be fast, easy, and accurate. That's why we engineered Trunk Builder with grower in mind. Trunk-Builder was designed with it's own stake driver to help the narrow profile slice through tough ground that can stop wood and hollow plastic stakes in their tracks. Whether you're planting 5 trees or 5,000, Trunk-Builder stakes drive like a dream saving you time and money but getting the stake into the ground is only the beginning. 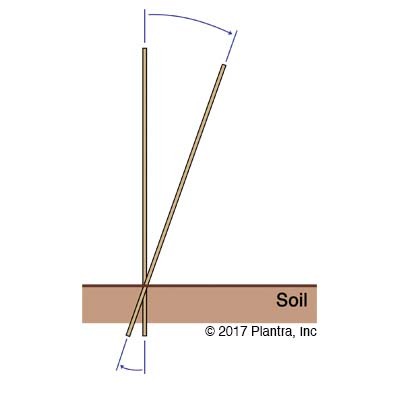 Trunk-Builder is also matched to SunFlex Grow Tube heights and comes complete with the only ground line indicator on the market which means no more guessing about how deep to drive the stake (see image below).